You had a good run Arecibo, but there’s a new big dog in town. 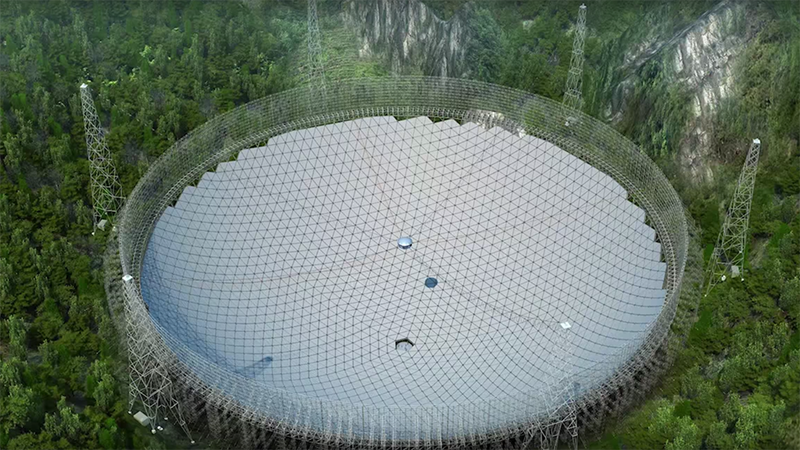 China has switched on the massive dish that now officially holds the record for the world’s largest single-aperture telescope. Among other things, researchers hope it will provide a big boost in the hunt for extraterrestrial life. What’s been dubbed the “FAST” (Five-hundred-meter Aperture Spherical Telescope) officially began operating around noon yesterday. It’s 200 meters larger than the Arecibo Observatory in Puerto Rico which, at 305 meters, has dominated the telescope size game since the 1960’s. Just to give you an idea of the scale, FAST is roughly the size of 30 soccer fields. FAST’s size matters. It’s tremendously powerful and has a field of vision that’s reportedly twice as large as the Arecibo Observatory. As far as sensitivity is concerned, the Chinese telescope is 10 times more powerful than its closest competitor, the 100-meter telescope near Bonn, Germany. The telescope will also help scientists detect more pulsars. That means they will have greater capabilities when it comes to tracing gravitational waves or ripples in space-time which could lead to a better understanding of the evolution of galaxies and the origins of the universe. Building such an enormous project comes at a price. Not only did China invest $180 million into the construction of the telescope, but it also hascontroversially relocated between nine and ten thousand residents of the Guizhou province. Those citizens were rehoused in the nearby counties of Pingtang and Luodian due to concerns of magnetic interference. Chinese President Xi Jinping has made space exploration a top priority. In 2013, the country landed the first space rover on the moon since 1976. Plans have been set to build a space station by 2022 and land a man on the moon by 2036. For the next two to three years, China’s astronomers will be given priority at FAST. It will later be opened to scientists around the globe.